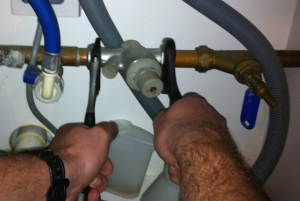 When it comes to dealing with your plumbing ADI plumbers don’t just rely on brute force or guess work when we’re dealing with your issues. Our years of experience in the plumbing industry combined with some highly specialized training means we can offer all of our customers a truly professional plumbing service. We do obviously specialize in providing help with plumbing problems but we also offer two other services called leak detection and power flushing which can come in very handy on many plumbing jobs. This service employs a range of equipment designed to remove any blockages of dirt or limescale from inside your plumbing or heating pipes. The fewer blockages you have the more efficiently your heating system can operate and the more money you’ll save as a result on your heating bill. We also provide a leak detection service where we deploy some very advanced technology to help us find the source of any leak anywhere inside or outside your home. The best part of this service is that we can do this tracing without needing to dig holes, rip up floorboards or dig up your lawn – your property remains intact during a leak detection survey from ADI. Our customer service team would love to hear from you now on 0800 731 3848 – why not give them a FREE call today?